Anktangle: Farm Fresh: The Beet! Welcome to my Summertime Foodie Friday series: Farm Fresh! I decided to take advantage of the abundance of the Summer growing season by featuring a new unusual vegetable each week. These vegetables may be ones you've had before, or ones you've heard of but never dared to taste. Or, they may be ones you had no idea how to prepare to eat. I'll include a bit of information about the vegetable, a simple recipe, and a linky so you can share your favorite recipe featuring the vegetable of the week. The link collections will be open for a full month after I feature a vegetable, so you can experiment with it and then come back here and link up your successes! The series will run through the end of August, and I'll publish a post every week or two. So far, I've featured artichoke, kale, eggplant, and this week, the beet! If there's a vegetable you'd like to see featured in the series, or if you have a preparation tip to add, please let me know in the comments. And don't forget to link up your beet recipes below! What we usually think of as a beet is really the beet root, but the beet is one of those vegetables that doesn't have any parts that are inedible. The young leaves and stems can be eaten raw in salads, more mature leaves can be stir fried (and used in dishes as you would spinach or kale), and the bulbous root can be cooked and eaten, too. It is a very useful vegetable! I have to admit, I didn't used to like beets. I had an early childhood aversion experience with beets at a church dinner once (it involved pickled beets and me mistaking them for slices of jellied cranberry sauce) so I wrote them off way back then. When I was first living with my partner, we had a CSA delivery, and beets came in it one day. I told him, that I hated beets, but he insisted that I try them again, fresh (not pickled). I humored him, and tried one tiny little bite of beet, which he had steamed. To my great surprise, I found I liked them! I think that thinking of them like carrots is a good way to approach a beet. They have a similar combination of sweetness and bitterness, and they're good cooked in some of the same ways. I think beets generally taste better in sweeter preparations rather than savory (though I know many would disagree with me on that). My favorite way to cook beets is still the way I had them that first (second) time: steamed (maybe with a little butter on top). Slice the beets into bite-sized chunks, and place into a steaming basket (inside a large pot and on top of a couple inches of water). My beets were cut into about 1" cubes. Steam beets covered, over medium-high heat for 5-15 minutes, or until they're tender when poked with a fork. Mine took right around 15 minutes. the golden beets, but it didn't make them any less delicious! I've been joking with Jaymz that this series is turning into How to Make Chips and Fries Out of Unusual Vegetables, because here I am for the third week in a row doing just that! I had a specific request to attempt to make beet chips for this week's recipe (Hi, Amanda!) so I took the recipe she offered and tried making them. I wanted so badly to make the beet chips work, that I ended up making them two different ways! 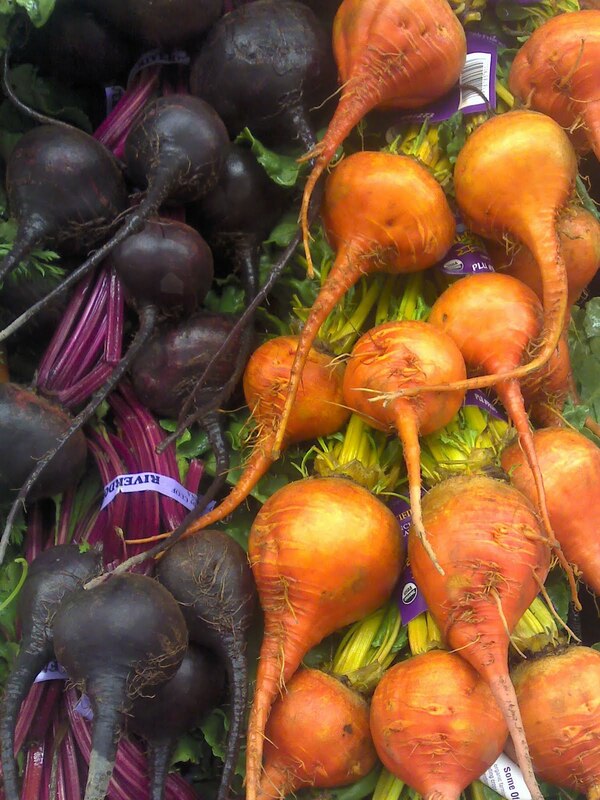 Choose a few (3-4) medium sized beets. The wider/larger they are, the less likely it is that your chips will curl up when you cook them. Peel your beets and cut off both ends (so they're a bit more flat than round). Slice very thinly with a mandolin, probably on the smallest setting. (This is one of those instances when using a gadget like this will come in handy. Uniform thickness—and more importantly in this case, thinness—is quite important for beet chips.) If you slice them at the right angle, you'll get a fun swirly pattern on your chips. Lay out the beet slices on the dehydrator trays (and, optionally, salt lightly). the trays are visible through the beets. Dehydrate at 135°F for about 30 hours, or until they reach your desired level of crispiness. Daniel loves these beet chips now! They're crispy and a little sweet, and he's been eating them all the time. I don't like them quite as much as the kale chips, but they're pretty good. Though, I must say, that if you don't like the flavor of beets, you probably won't like these chips. I think the flavor is much stronger in both these methods than just eating them steamed. How do you like to eat beets? OK, you have done what has been impossible: You have convinced me to try steamed beets. The combo of the two kinds looks very appealing. I'm going to the farmer's market today and see if there are other unusual veggies I can try, or perhaps I can even find something to inspire one of your future posts! oh my gosh, I can't believe I didn't think of beet chips!! We buy Terra chips and love them. Much better to make them. I love my dehydrater too. We make crazy good dried persimmon when our giant tree produces. yum! @Fresh and Feisty: What a great idea! I added your recipe to the linky. Thank you!